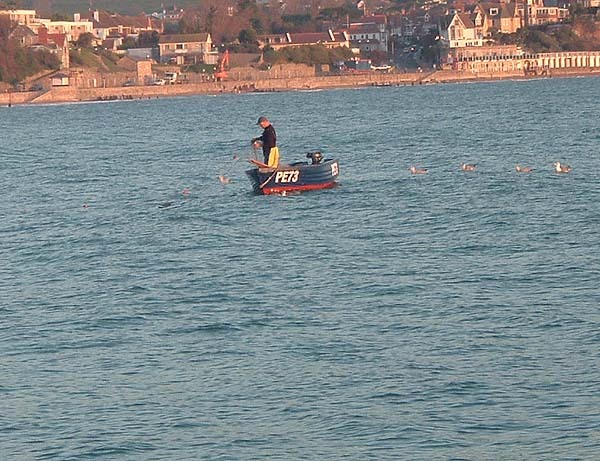 I went to Swanage the other morning to try an hour's spinning. On about my third cast in the gloom the lure got hung up as I retrieved. I was quite surprised as it was clearly high water and I thought that the spot was snag free. After a couple of minutes pulling this way and that, to my relief, it came free. I walked on a bit to avoid the snag (whatever it was) and continued fishing. For once (unusually) there was nothing doing, I did not even have a touch despite what appeared to be excellent conditions. 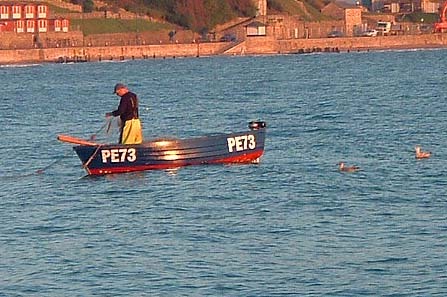 On my way back I saw a local fisherman launching his small boat from the slipway. I said "Hello!" and walked on. As I approached the spot where my lure had snagged in the darkness, about twenty yards out, I could see a row of sausage shaped white floats - a gill net - that explained the problem and I was amazed that the lure had managed to free itself from the headline. 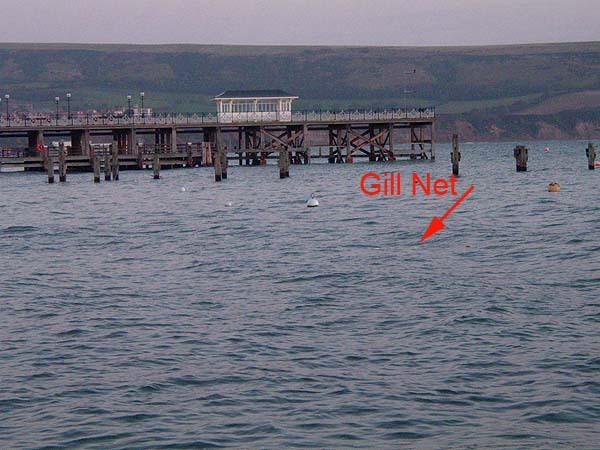 By now the chap in his small boat had motored on through the pier supports and when I got back to the sea front I could see that he was lifting another gill net. It was obviously full of fish and I could see him dropping them back into a box behind him as he removed them from the net. Out with the little binoculars and have a look to see what he was catching. I expected to see school bass but in fact, as far as I could tell most of the fish were pollack of a pound or two. He must have had the best part of a hundred as I watched. Certainly there were one or two fish in every couple of metres of net. There may have been some bass too but I did not see any that I could recognise. Presumably the catch was mostly used for pot baits. Of course this sort of thing can be a bit depressing when you haven't had a sniff but it was interesting to see the numbers of fish in such shallow water over a fairly clean bottom. It's filed away in my mind for future reference.